Largo: Christ of the Abyss? 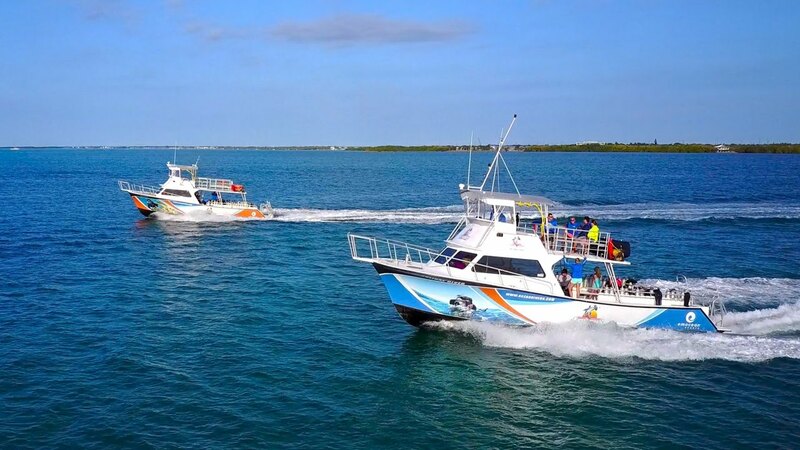 The Ocean Divers’ fleet of boats take divers to experience the best sites in Key Largo. From wrecks like the Spiegel Grove and USCGC Duane to the iconic shallow dive on the Christ of the Abyss statue and the famous Molasses Reef, there’s something for everyone in your group when you book with Ocean Divers Key Largo. With boat-departure times staggered throughout the day, there’s always a charter ready when you are. It’s as easy as check in and head out into the waters you came to explore! The knowledgeable and enthusiastic crew keep diving in Key Largo fresh by offering special trips throughout the year. Special dive charters may include three-tank wreck treks, lionfish derbies to fight the invasive species, full-moon night dives, lobster hunting, and spearfishing charters. For conservation-focused divers, Ocean Divers hosts dive charters specifically for reef cleanups and reef fish counts to keep Key Largo’s underwater ecosystem healthy. Whether you’re scuba diving, snorkeling, freediving, rebreather diving or enjoying the ocean, there is something for everyone when you dive with Ocean Divers! Ocean Divers is a PADI 5-Star Instruction facility with 35 years of experience operating as a world-class dive center. The experienced and knowledgeable instructors are geared up and ready to train divers of all skill levels. With Discover Scuba and Open Water Diver certifications, Ocean Divers introduces you to the amazing underwater world for the first time. For divers already certified, Ocean Divers will help you expand your dive expertise with a variety of advanced training and specialty courses, or re-open those gills and get your old dusty certification ReActivated. Ocean Divers is proud to be a Blue Star Operator and is committed to the preservation of our coral reefs, and to the Florida Keys National Marine Sanctuary. To help emphasize that commitment, Ocean Divers now provides a complimentary guide on board for our divers to take advantage of. Their local knowledge and expertise is available to share with you! If it has been more than 12 months since your last dive, we strongly recommend a Refresher Course or the hire of a private dive guide. If longer than 24 months since your last dive, a Refresher Course is required.